And Jonathan said to [David]: Tomorrow is the new month; you will be remembered, for your seat will be vacant. In the first mitzvah commanded us as a nation, G‑d decreed that we link our lives to the moon. He instructed us to establish a calendar that is predicated upon the lunar month—the 29.5-day cycle in which the moon, as perceived by an earthly observer, completes its revolution around the earth. The new moon is the night on which the moon is first visible after its monthly disappearance from our nighttime sky. The alignment and movement of the moon in relation to the earth and sun means that, to the earthly observer, the moon passes through phases in which it grows and diminishes—and, at one point in its cycle, disappears altogether. When the moon is closest to the sun, positioned between the sun and earth, its lighted side—the side illuminated by the sun’s light—faces away from the earth, so that it is invisible to us. As it moves away from the sun to orbit the earth, it appears first as a thin crescent of light, and continues to grow and fill for the next fifteen days. Midway through its orbit, when it is furthest from the sun and the earth is between the sun and the moon, the lighted half of the moon is entirely visible on earth, so that it appears as a complete sphere in the heavens and bathes our night with the full luminescence of its pacific glow. Then, as the moon continues its orbit of the earth, moving closer to the sun, less and less of it is visible to us; the sphere shrinks by nightly increments to a half-sphere and then to progressively leaner slivers of light, until, at the point of its greatest proximity to the sun, it once more disappears from our view. The night on which the moon is first visible after its hiatus is the first of the Jewish month (hence the Hebrew word for month, chodesh, from the root chadash, “new”). The month consists of 29 or 30 days, until the next new moon marks the onset of a new month. The first half of the Jewish month is thus marked by a nightly growing moon, which reaches its full luminescent potential on the night of the 15th; but on the 16th of the month the moon is already diminished, and it continues to shrink nightly until a new moon and month are born. The people of Israel, says the Zohar, mark time with the moon because they emulate the moon. Like the moon, the Jewish people dip and soar through history, our regressions and defeats but preludes to yet another rebirth, yet another renewal. The story of the moon is the story of a nation, and the story of every productive life: lack fuels initiative, setbacks stimulate growth, and one’s highest achievements are born out of moments of diminution and depreciation. Thus was born the month. For not only was the moon reduced to a pale reflector of another’s light, it was further diminished in that its illumination of the earth would be curtailed by the constant changes in its juxtaposition with the source and the recipient of its light. For two weeks of each month, the moon faithfully fulfills the divine decree, “Go, diminish yourself,” steadily reducing itself to the point in which it is completely enveloped in darkness. These repeated diminutions are what yield the unique qualities of lunar time. Living with the moon, we learn how darkness can give birth to light, and how absence can generate renewed presence. We learn to exploit the momentum of our descents to scale new and unprecedented heights—heights which could never be anticipated by an unvarying “solar” path through life. On a deeper level, the injunction “Go, diminish yourself” relates to the very essence of our humanity. Man is unique among G‑d’s creations in that he alone is a mehalech, a “goer” or journeyer through life. All other creations, including the loftiest of spiritual beings (and this includes the soul of man prior to its investiture in a physical body) are omdim, stationary “standers.” A “stander” is not necessarily immobile; indeed, all things possess, to some degree or other, the potential for development and advancement. But all creations move in a “solar” orbit—an orbit defined by preordained limits which it cannot transcend. Only the human being is lunar, with a trajectory through life that includes both growth and decline, obliteration and rebirth. For man alone possesses the power of free choice—a power as potent as it is lethal, as infinite as it is constricting. With free choice comes the capacity for utter self-destruction, and the capacity for utter self-transformation. Man has the power to negate everything he is and stands for, and in the next moment, to recreate himself in a new mold and embark on a path that his prior existence could never have anticipated. “Go, diminish yourself” is the Creator’s perpetual injunction to His lunar creation. For it is only by diminishing itself that the human soul can “go.” Only by making itself vulnerable to the mortality and pitfalls of the physical state can the soul of man become a “goer,” a being with the power to make of itself more than it is. This is the message implicit in the haftorah (reading from the Prophets) read in the synagogue when Shabbat falls on the day before Rosh Chodesh, as the first of the month is called. The opening verse of this haftorah reads: “And Jonathan said to [David]: Tomorrow is the new month. You will be remembered, for your seat will be vacant.” David has reason to suspect that King Saul wishes him harm, so he plans to avoid the royal palace. Jonathan tells him that his very absence will attract Saul’s notice, inducing the king to reveal his intentions toward him. 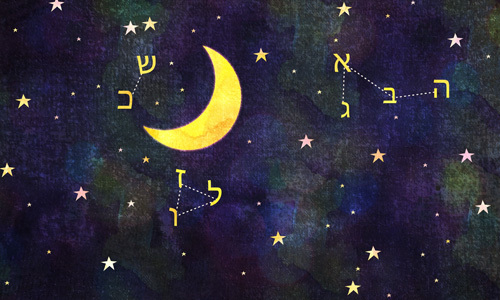 At first glance, the connection between the haftorah and the new month seems merely incidental—the reading begins by relating a conversation that took place on the day before Rosh Chodesh, so we read it on the day before Rosh Chodesh. But upon closer examination, Jonathan’s words to David express the deeper significance of the lunar month, and particularly of the day before Rosh Chodesh—the day of the moon’s disappearance. Jonathan tells David: “you will be remembered because your seat will be vacant.” The key word in the Hebrew original of this sentence is pakod, which is the root of both venifkadta, “you will be remembered,” and yipaked, “will be vacant.” Indeed, the two are intertwined: we are remembered when we are missed. Like the vacuum which draws liquid into a syringe, it is the voids and absences of life that compel its greatest achievements and fulfillments. This is the essence of lunar time, to which the Jew sets the rhythm of his individual and communal life: oblivion as the harbinger of renewal; darkness as the impetus for reborn light. Thus, the fifteenth of the Jewish month, the day on which the moon achieves the pinnacle of its luminary potential, marks the high point of that month’s particular contribution to Jewish life. Nissan is the “month of redemption,” and it is on the first day of Nissan that the process of our liberation from Egypt began; but the results of this process were fully manifest only on the 15th of Nissan, the day of the Exodus, which we celebrate each year as the festival of Passover, and and on which we re-experience the divine gift of freedom through the observances and customs of the Seder. By the same token, the first of Tishrei is the day on which we crown G‑d as king of the universe, rededicating the entirety of creation to the purpose for which it was created, and evoking in G‑d the desire to continue to create and sustain it; but the celebration of the divine coronation is eclipsed by the days of solemnity and awe which occupy the first part of Tishrei, coming to fruition only on the joyous festival of Sukkot, which commences on the fifteenth of the month. The same is true of each of the twelve months of the Jewish year. Each has its own unique import and quality, and each undergoes a cycle of diminution and growth, concealment and expression, which reaches its climax on the fifteenth of the month. Thus we have the “New Year for Trees” on the 15th of Shevat; Purim on the 14th and 15th of Adar; and the 15th of Av, which the Talmud calls “the greatest festival” on the Jewish calendar. Yet the sixteenth is greater than the fifteenth. In Torah, everything is precise and meaningful. So if the fifteenth were truly the apex of the month, it would also be represented by its highest numerical figure. Yet, following the fifteenth, we have a day which the Torah regards as the sixteenth—a number greater than fifteen. And the numbers continue to climb: seventeen, eighteen, nineteen, and so forth, up to the 29th or the 30th. According to this, the loftiest day of the month is the day on which the light of the moon is completely concealed! But, as we have already noted, the point at which the moon disappears from our earthly view is also the point at which it achieves its greatest proximity to the sun. In other words, there are two perspectives from which the lunar cycle may be viewed: from the perspective of the moon’s illumination of the earth, or from the perspective of the moon’s relationship with the source of its light, the sun. Viewed from the first perspective, the moon undergoes changes and diminutions, achieving its full luminary potential only after an arduous climb of fifteen days, and then waning to nothingness in the course of the latter half of the month. Viewed from the second perspective, the moon is, of course, never diminished: it remains the same size throughout its orbit, and the light of the sun bathes its surface at all times (except in the case of a lunar eclipse, when the earth comes directly between the sun and moon and blocks the light of the sun from reaching the moon). Indeed, the very point at which the moon is completely dark (and thus nonexistent) to the earthly observer is the apex of the moon’s relationship with the sun—the point at which the sun’s illumination of the moon is at its brightest and most intense. Based on talks delivered by the Rebbe on Rosh Chodesh Kislev and Kislev 16, 5752 (November 7 and 23, 1991), and on other occasions (Sefer HaSichot 5752, pp. 122–133, pp. 155–159, et al). New Moon Regarding the terms "new Moon" and "1st crescent", I believe the definition of "new moon" was set by HaShem as the 1st crescent, but as years gone by as more people on Earth does not accept the authority of our Creator, the occurrence of "astronomical new moon" became (wrongly) the definition of "new moon". Lunar cycle Dear Editor, I must commend “The Rebbe" for his description. Usually the term new moon refers to the day or so when the moon is not visible. The Rebbe in this piece makes it clear that the first day the moon is visible is called the New Moon. The dist of the moon from the sun in actuality depends on the Earth's orbit rather than the moons'. Closest to sun on Jan 1 and most distant on Jul 1. The perihelion and the aphelion days, but the Rebbe obviously meant closest within a single month period which is precisely correct.